A clean-sheet design crafted specifically for the popular RV series aircraft, the 200RV is the ultimate RV prop! As the first propeller designed specifically for the RV series, our engineering formulas incorporated the precise frontal area, aircraft speed envelope, aircraft weight, operating rpm, and slow down effect (airspeed differentials as they flow around the aircraft shape and are different distances from the surfaces) of the RV series aircraft. Most significantly, the 200RV incorporates Whirl Wind's Opti-Q® airfoil technology in an optimum 72" configuration for the RV. The Opti-Q® airfoil optimizes the blade taper ratio, twist distribution, and planform for the lowest possible induced drag and the minimum profile drag. Our design goals were to maximize efficiency at cruise speed in the RV airframe range by minimizing induced loss, minimizing blade profile drag, minimizing weight, and minimizing the noise footprint. 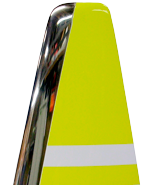 Optimum blade angles are precisely configured for the RV aircraft using slow down. Most notable in the design are the low-Q tips. Specific to its mission the 200RV features approximately 60% of the blade area of the 200C thereby reducing parasitic drag for those fast cruise speeds. Finally, a no-compromise solution for those wishing to maximize the cruise, climb, and top speed performance of their Van's RV series aircraft! 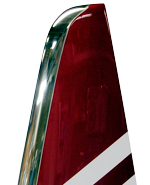 The RV10 is a two blade 80" propeller developed specifically for the Van's RV-10 airframe. Like our successful 200RV design, our RV-10 propeller is a true Betz, Goldstein, Theodorsen (BGT) minimum induced loss blade design. The airfoil is a mathematically perfect shape blade like the elliptical wing platform of the Spitfire fighter. A BGT blade design produces less drag and therefore decreases the torque demand and required horsepower, resulting in maximum thrust and maximum efficiency. Additionally, the light weight of the system has considerable CG benefit on the RV-10 airframe, which is commonly nose heavy. RV Series models consist of two or three carbon fiber blades with nickel leading edge erosion shields, billet machined aluminum hub and a composite spinner. This propeller can be flown in rain and off unimproved airstrips. Whirl Wind 200 Series props work with any conventional prop governor such as McCauley, Woodward, or Jihostroj. Whirl Wind can supply the Jihostroj P920-028 governor, which we prefer due to its proven reliability, compact (4.9" base to arm) design, and light 2 lbs weight, and excellent construction quality. Spinner: Composite 13" or 13.9"
Note: The 200RV is also available with a swept tip. ** Light weight CG benefit on RV-10 airframe.